Predicting the weather is an inexact science. The weatherman often seems to get it wrong, and you find you really didn't need to lug that umbrella around on what turned out to be a sunny day. Crowd-sourced, hyperlocal weather information has been touted as one solution, and web-oriented weather companies are pushing short-term forecasts, also known as "nowcasting," to sky watchers everywhere. As weather apps and consumer hardware proliferate, advocates say millions of smartphones and other devices at hand are providing more accurate predictions than traditional models of forecasting. Introduced in July 2015, AccUcast is a crowdsourcing weather feature in the AccuWeather universal iOS app. Japan-based Weathernews has a popular app, Weathernews Touch, with a user base of some 8 million people across the country. Users upload photos of local sky conditions as well as subjective commentary such as how hot it really feels at a given location. The company's meteorologists review data and help produce localized forecasts. Weathernews also relies on a distributed sensor network for data. In addition to about 1,000 spherical “pollen robot” sensors that can detect airborne pollen, it has given out palm-sized WxBeacon sensors that can detect changes in temperature, barometric pressure and humidity, automatically uploading that data to the Weathernews cloud. "In Japan, according to our verification, our crowd-sourced forecast model’s accuracy is approximately 10 to 20 percent higher than traditional weather forecast models on average," said Ryosuke Ueyama, a spokesman for Weathernews. "The crowd-sourced forecast model works really well at one to three hours short range forecast as we operate 24 hours and update our weather information in real time," he said. Ueyama said the insights of millions of users eclipse the predictive powers of the state-run Japan Meteorological Agency (JMA) when it comes to the nation's most important weather event -- the blooming of cherry trees in spring. The JMA used to devote a supercomputer to forecast the cherry front as it moved up the archipelago, but then switched to blooming estimates based on sample trees. It abandoned the cherry predictions altogether in 2009. In contrast, the Weathernews Touch app has crowd-based forecasts of blossoms for 700 locations across Japan. Since more data can yield better accuracy, weather companies are competing for the biggest datasets. Weathernews recently acquired Boston-based social weather company Weathermob, which has an app of the same name that claims over 100,000 monthly active users. It also formed partnerships with the China-based MoWeather app, as well as France's Netatmo, which has an international network of home weather stations. With these moves, Weathernews now claims more than 100 million active monthly users across 175 countries. Crowd-sourcing weather info isn't new, but more and more companies are tapping people power. 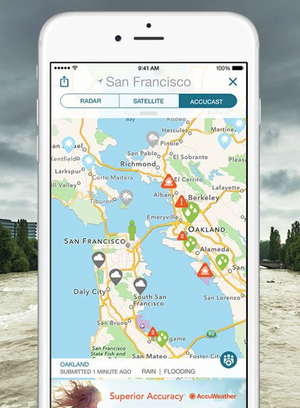 Last month, U.S. weather news provider AccuWeather launched its first direct consumer crowd-sourcing feature, AccUcast. The service draws on real-time weather and road conditions submitted by users of the AccuWeather iOS app. Users can select from conditions such as "partly cloudy" and road conditions such as "reduced visibility." Each report is represented by a pin on an interactive animated global weather map. "We receive and manage more than 12 billion data requests every day," AccuWeather's president of digital media, Steve Smith, said via email. "Our team takes this information and uses a combination of proprietary algorithms, expert system modeling, unique foundational datasets and the experience of more than 100 meteorologists to deliver trusted weather reporting for any location on Earth." Some experts caution, though, that crowd-sourced weather isn't yet as reliable as it's made out to be. "Most of the crowd-sourcing claims are hype with little basis," Cliff Mass, a professor of atmospheric sciences at the University of Washington who has a prominent blog about the weather, said via email. The exception is pressure readings from phones, said Mass, who coauthored a paper in the Bulletin of the American Meteorological Society outlining what the coming network of hundreds of millions of smartphones with barometers means for forecasting. Already, apps such as WeatherSignal and PressureNet, which can measure barometric pressure, are gaining traction and attracting the attention of meteorologists. When acclaimed iOS weather app Dark Sky, which also uses the crowd, announced an update in June, it included support for pressure readings from the iPhone 6, the first Apple phone to pack a barometer. Pressure sensors have been in other smartphones for some time, but the iPhone’s popularity is helping turn mobile devices into a useful sensor network that can help with forecasting. Dedicated weather stations at fixed locations are another important source of weather data supplied by the crowd, Mass said. "Smartphones are an excellent delivery tool of weather information, but no one has proved it to be a useful weather observation tool."